The mastic tree or masticha (“Mastiha”) in Greek, produces a creamy white resin, which is edible. It is a type of gum that grows in one place in the world — the island of Chios in Greece. Masticha has been harvested for at least 2,500 years since Greek Antiquity. 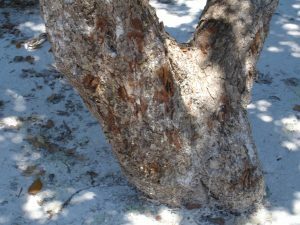 My first encounter with the mastic tree was when I was about 5 years old and living on the island of Psara, Greece. This island is part of the Chios island prefecture. 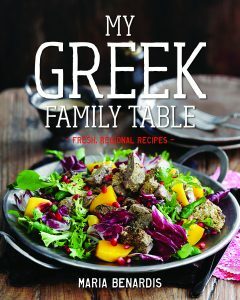 I relay the detailed story in detail in my new book “My Greek Family Table”. My cousin Theodora wanted to show me a syringe and play doctors and I was so excited that whilst running up the steps made of uneven rocks I fell and broke my arm. I had to go to Chios with my grandmother to have arm set in plaster because this could not be done on the island of Psara. It was in Chios that I saw for the first-time the mastic tree. I had never smelt anything so sweet and beautiful as mastic gum. I recall asking my grandmother why the trees were crying. The mastic resin on the trees looked like tear drops. My grandmother and I brought back home some masticha from Chios which we used to make many delicious dishes. I still enjoy using these ingredients and especially masticha in my cooking and when doing so I remember the day in Chios when I discovered them. In Greek culture, it is believed that the mastic trees began to produce the resin (tears from crying) in sympathy when the Romans tortured a Christian martyr and left him to die in a mastic grove. Herodotus, however, had noted their behavior in fifth century BC. Masticha is also used in the church for blessing. Hippocrates, Theophrastus, Dioscorides and Gallinos all knew of its healing properties and the ladies of Rome were using toothpicks from mastic trees because of the property it had to whiten teeth. The first mention of actual mastic ‘tears’ was by Hippocrates. Hippocrates used mastic for the prevention of digestive problems, colds and as a breath freshener. Roman emperors used mastic along with honey, pepper, and egg in the spiced wine conditum paradoxum. The masticha from Chios has been recognized since ancient times both for its distinctive aroma and its healing properties. It has antimicrobial, antioxidant, anti-inflammatory, anti-cancerous, wound regeneration and therapeutic properties. It is used as an ingredient in ointments against burns and relieves skin conditions such as acne. In ancient times it was used as a remedy for stomach ailments and to aid digestion. Hippocrates used to mix masticha with honey to cure bellyaches and colds. Dioscorides also recognized it as beneficial for digestion and dental hygiene. He described it as ‘good for disorders in the womb — gently warming, astringent, softening. It is also good laid on the stomach for hardened swellings, for the abdominal cavity and dysentery; and for cleaning away spots on the face, and causing a good color’. The studies at the University of Nottingham published in the New England Journal of Medicine outline that even a minimal dose of (1 mg daily for two weeks) of masticha can heal peptic ulcer, (caused by a bacteria), with its antimicrobial action, and so is its effect on the liver function, it stimulates the detoxifying activity, absorbing cholesterol, whose concentration in blood is reduced, thereby reducing the risk of cardiovascular diseases. Mastic can be found in a variety of products for food, perfume, dental products, cosmetics, hygiene and for healing. In cookery, it can be found in cakes, pastries, jams, ice cream, spoon sweets, chocolate; chewing gum, lollies, tea, coffee, milk, pasta, sauces, liqueurs, and it is also used a natural preservative for food. The spice has a unique, musky, woody, slightly piney, incense-like flavor that can be paired with almost anything from a rich tomatoes sauce, to white wine and lemon, and chocolate. In order to prepare the masticha for cooking purposes the crystals need to be pounded in a mortar or pestle or spice grinder but always with the addition of either a little salt (for savory foods) or a little sugar (for sweets). Sometimes flour is used. Below is one of my many treasured recipes using masticha. The recipe is from my book/ebook “Cooking & Eating Wisdom for Better Health”. Bread making was passed on to Greece from the Egyptians, then the Greeks taught the Romans how to make it. The ancient Greeks considered bread making an early mark of civilization that lifted them above other people. The Romans grew to love Greek bread so highly that almost all the bakers in the entire Roman Empire were Greeks. The Greeks developed and mastered bread. They developed the techniques of separating the husks and other indelible parts of the grain from the nutritious kernel. They discovered which types of flours were suited for which breads and they used all types of grains and made unleavened breads raised with a starter of baking powder called nitron (“natron”). They also had wine-based yeast from the fermentation of grapes. The bread of Athens and Megara had a well-deserved reputation because its whiteness dazzled the eye and its taste was exquisite. It was delicately kneaded with honey or wine and often cheeses were mixed in. The Greeks baked their breads in ovens, under ashes, over coals, and between two pieces of iron molds. 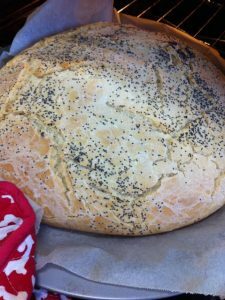 I have garnished my bread with poppy seeds as they did in ancient times. Place the sugar and masticha in a mortar and pestle and pound until you get a smooth powder. Place the flour in a large bowl. Make a well in the middle and add the sea salt and the masticha and sugar mixture. Dissolve the yeast in 1 cup of the warm water and pour it into the well in the flour. Add the olive oil. Mix all the ingredients and gradually add the remaining water while mixing with your hands until a firm dough forms. Place the dough on a lightly floured surface and knead for at least 10 minutes. Return the dough to the bowl, lightly cover it with a tea towel and set aside for at least 1 hour until the dough has almost doubled in size. Preheat the oven to 320F (160˚C). Remove the dough from the bowl and form it into a round roll. Place the dough on a baking tray lined with baking paper, cover with a tea towel and leave for another 30 minutes. Brush the top of the bread with olive oil and sprinkle over the poppy seeds, then bake in the oven for about 40–45 minutes until the bread is golden brown and cooked through. 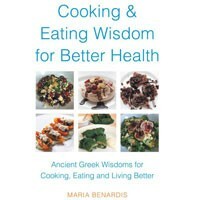 Maria Benardis also has a new book/ebook titled “My Greek Family Table”. Yes its my most treasured and loved spice. I grew up on the neighboring island of Psara.I discuss its healing properties in my two books / ebooks My Greek Family Table and Cooking & Eating Wisdom for Better Health.